These sprockets fit on most back pedal brake hubs and hub gearing systems from SRAM, Sturmey Archer and Shimano - all those which use the three splines method of mounting. 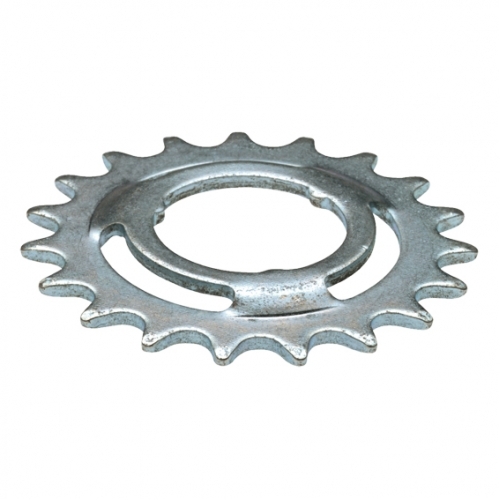 The life-span of these parts is normally very long, but a worn sprocket promotes wear of your chain, so it is best to replace them when they look worn. You can also change the sprocket to adjust your gearing ratios. Fitting a larger sprocket will reduce the gearing on your bike, making starting off and climbing hills easier. Fitting a smaller sprocket increases your ratios, making it easier to ride at higher speeds. On three speed bicycles, I like to have the middle gear (number two) as the one I normally use as this is the most efficient of the three. By adjusting the sprocket size it is possible to arrange that most of your time is spent in the middle gear, leaving bottom gear for setting off, climbing hills or stiff headwinds and top gear for downhill or when riding with a tailwind. If you live in a hilly area, it may be worth setting up your bike so that the top gear is best for cruising on the flat while 1 & 2 give two options for climbing hills. Some of the sprockets are made by the manufacturers named in the title, some are generic products which have no manufacturer's mark. All are functionally identical. Please choose a 2.1 mm or 2.9 mm wide sprocket depending on the width of your chain, and either a dished or flat sprocket depending on what is required to keep your chainline correct. All sprockets have a 35 mm hole in the middle and are held in place by three prongs. See additional images for a photo.